3 Spool Detented * 580PSI to 1150PSI * 3 Position * SAE Ports #8 * Power Beyond * Parallel Circut * Look into these outstanding features: Compact construction. Low pressure drop. * Long service life. High efficiency. * Choice of various operation methods, such as manual, pneumatic, hydraulic, and electro-hydraulic. 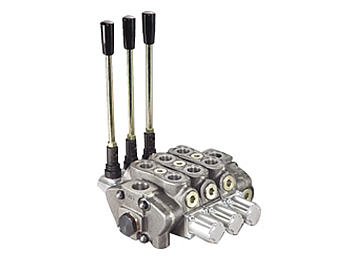 * Choice of various ports and circuit valves. * High accuracy spool is hardened for long term accuracy. * Sub-plate mounting. * Handle shift operation.